I am beyond the cold winter months and ready to roll April in. 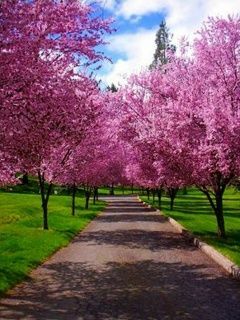 With its longer days of sunlight and warmer days, the coming of green grass, flowers blooming and best of all, the redbud trees. There is nothing like April in Indiana. The northern half of the state is flat from the ice glaziers of centuries ago. But I live in the west central part of the state where the glaziers stopped and the topography changes into rolling hills and lots of tall trees. Living in a small town of a population of 700, Chicago is just under two hours north and Indianapolis is one hour south of me. So, I can enjoy the big cities whenever the need or want should arise and when going to Chicago, I usually go by train. But in the month of April, I make a drive and follow the redbud trees south to the Ohio River. Then go east and enjoy the scenic river with the redbud trees nestled in. My drive ends at Madison, Indiana. An historic town that sets on the banks of the Ohio River, with the state of Kentucky across the wide river. During the towns heyday, barges and the paddlewheel boats were the major transports of people and supplies into the expansion of the western part of the nation. Coming in from Cincinnati and Louisville, Madison was a stop for more passengers to board or to disembark. But unlike most river towns from that era, Madison, although small, remains a bustling town of about 12,000 people and another 55,000 within a 15 mile radius. With a very active downtown, there are plenty of stores and unique shopping places. Lots of fine restaurants and hotels dot the area. So, Madison, out of four, is my first working vacation of the year. I will stay at the Hillside Inn, where the famous “Rat Pack” stayed while filming, “Some Came Running” in 1958. Sitting on top of a hill, each room and suite overlooks the Ohio river and the town. The hotel has been completely remodeled and is quite beautiful in details on the inside. Each room has a sliding glass door where you can step out onto a large balcony to take in the view. There is a table with four chairs and so plenty of room to work. Most evenings, I will slide into Joey’s for dinner. It is the only place in town with a piano bar until the main band plays at 9 pm. I asked Joey once how he ended up in Madison. Due to fallen hard times was on his way home from Cincinnati and stopped in Madison to eat. Fell in love with the town and the place was for sale and so he bought it. Never a day of regret he said. As I will begin my day, it never fails that a gentle breeze will move in as the sun rises and will shift the blanket of the fog that lies on the river almost every morning. Checking all of my social media profiles and make sure they are up to date. Include some new photos of both me and the team. I’ll highlight a new product/service or refresh on the benefits on a product/service. Review all websites and look for spelling errors and broken links. Missing information. I’ll put myself in a customer’s shoes and strive to improve my conversion rate. For those of you armed with our customizable app, be sure to use the Alert Page at least once daily, strive for twice. This is a unique feature that no other app has. If you have not done so yet, kick April off with a VIP App Club and then run specials geared toward your members. Since the App is also a mini website. I will review and make changes. Update videos. Make sure I am on target with my message. I’ll review my marketing strategy for the coming summer months and make sure I have at least one major event a month that I will sponsor locally. This usually pays off during Christmas season. This past season, tablets and Apps were my biggest movers. They order straight from the website since I don’t have a brick and mortar. If you are one not to take working vacations, why not? If you are working while taking one, it is tax deductible. So, take one and reward yourself. I like to take one each quarter or two in the fall. A change of pace and location will rejuvenate you.